Meet one of Africa’s fastest growing economies and a country in abundance of attractions for every type of tourist there is out there. The Republic of Zambia is a large country that is landlocked and encircled by 8 countries; Angola, Botswana, Namibia, Zimbabwe, Malawi, Tanzania, Mozambique and the Democratic Republic of Congo. With Lusaka as its capital, Zambia stands at twice the landmass of Zimbabwe at roughly more than 750,000km² and is famous for its abundant natural resources; hydroelectric power, large deposits of uranium, silver, emeralds and most particularly copper. A country dominated by a high plateau and garnished by mountains and hills with an average elevation on average between 1,000m and 1,600m above sea level. Despite being landlocked, Zambia is well endowed with water bodies; 18 rivers (including the famous Zambezi which forms a natural riverine border with Zimbabwe) and 9 lakes which include hydroelectric Lake Kariba, the world’s largest man-made lake. This stunning country is home to one of the world’s Seven Natural Wonders, Victoria Falls, but its history, people and culture are an amalgamation of astounding attractions that will satisfy a historian, anthropologist or artist. Zambia’s climate is tropical but is significantly moderated by altitude and the extended rainy season that lasts from October to April. From May to August the weather is generally very cool with average maximum temperatures of 24°C and minimum 11°C while the hottest period lies between September and December with temperatures averaging 30° at most and minimum average of 18°C. The abundance of rain and moderate temperatures of Zambia create an ideal ecosystem for a variety of species, both flora and fauna. There is a large number of plant species that provide sustenance to the enormous animal life in the country’s lush expanses. More than two thirds of the country is dominated by Miombo woodlands; Mopane woodlands, grassland and patches of trees and shrubs. Moist evergreen forests are found in the northern parts of Zambia along with teak forests in the western and north western parts of the country. This idyllic combination of vegetation along with most of the country being protected by national parks has successfully sustained an exhilarating animal life. Numerous species of antelope found in Zambia include impala and puku which attract predators like lions, leopards, and the relatively uncommon spotted hyenas and cheetah. A small population of black and white rhino also exists which is as a result of being reintroduced from South Africa. You will also find elephants and buffalo gallivanting in large herds in protected national parks. The country prides itself with one of only 6 other countries in Africa where you will find endangered species, namely the African wild dog, with other endangered species including the honey badger, aardvark, the pangolin and the Egyptian vultures that migrate from East Africa occasionally. The animal life is further promising for animal enthusiasts not only as a superb birding destination showcasing more than 750 different bird species, but also because you will find endemic and unusual species and subspecies of the black and Kafue Lechwe, Angolan and Thornicroft’s giraffe and Crawshay’s zebra. English is the official language of Zambia with Nyanja being the main local language, particularly in the capital Lusaka. There are also 11 other official Bantu languages including Bemba, Chewa and Lozi. Yellow fever certificates are compulsory for entry to Zambia; therefore you must acquire a yellow fever vaccination before arriving in the country. Further recommendations on vaccines include mumps, hepatitis A and B, typhoid, meningitis and measles amongst others. Precautionary means from disease and infection are not limited to vaccinations, measures can be taken against malaria by taking prophylactic drugs that are prescribed by your doctor and remember to wear long-sleeved shirts/ t-shirts and long trousers/ skirts particularly around sunrise and in the evenings. Apply an ample amount of mosquito repellent to prevent any mosquito bites and make use of the mosquito netting that is provided in hotels and resorts. Travel with some over-the-counter medication as a quick-fix from heartburn, headaches and diarrhoea. Also pack anti-histamines, bandages, hand sanitizers and your prescribed anti-malaria drugs. Remember to visit your doctor/ physician at least 6 weeks before your trip so he can recommend the most suitable vaccines and anti-malaria drugs. Visa fees for all passport holders are USD $50. South African passport holders do not require entry visas for Zambia, and US, Australian, New Zealand and most EU citizens are not required to acquire visa clearance before they arrive into Zambia, but we strongly suggest you arrange your visa prior to your departure. Remember to contact your travel agent or a Zambian diplomatic representative in your country when planning your trip and note that the above information is only a guideline and is subject to change. Also, ensure that your passport has at least 2 pages (if your only destination is Zambia) or 6 pages with multiple stops and a minimum of 6 months before expiration after you have returned from your trip(s). Chameleon will NOT be responsible for any discrepancies with your passport or visa. Make sure that you have a photocopy of your passport in the event your original gets lost. The US Dollar and South African Rand are widely accepted in Zambia. Credit cards are also widely accepted in most hotels, restaurants, travel agencies and big shops and shopping complexes and Visa cards will be accepted also as a means to access cash. If you would like to access an ATM machine, your options are varied as there are many ATM machines in the main cities and accessibility is through Standard Chartered, Stanbic and Barclay’s Bank. Traveller’s cheques are not accepted. Historically, Zambia has been known to have been economically driven by copper mining and the mining industry in general. Despite the decline of copper output, Zambia’s mining sector still enjoys great growths particularly in the output of nickel, tin and uranium all of which account for more than 35% of all export earnings. The extremely rich agrarian sector plays a crucial role in the nation’s economy where it provides more employment than the mining industry does and exports outputs in terms of tobacco, flowers, cotton, sugarcane and even electricity. Power outlets used in Zambia are UK 3-pin plugs. The largest and capital city of Zambia located in the southern part of the country, Lusaka, at 70km², connects your travels quite conveniently to all major highways that will take you to all corners of the country and stands at more than 1,000m above sea level. The commercial and administrative hub has historically been the capital of northern Rhodesia under British colonial rule. With more than 3 national museums, one of which is the Lusaka National Museum, Lusaka offers more than a dozen points of interest for all travellers but most importantly is known for its excellent climate for its residents and visitors, averaging 24°C in winter and 29°C in summer. Lusaka is a great place to explore the Zambian culture, colours, sights and sounds. The bustling local markets and endless stalls displaying rich colours, impressive crafts, unique arts and an outstanding performance of culture can be experienced in this city that is considered the fastest growing in Africa. You may experience the wildlife only minutes away from the heart of Lusaka through a great selection of game ranches, reptile farms, botanical gardens or the environmental park at the doorstep of the capital city. If you would like to take in more culture and history, the Lusaka offers many arts centres and more than 15 sites with historical resonance. At the Zambia-Zimbabwe border and on the Zambezi River you will find Victoria Falls, more commonly known as ‘the Smoke that Thunders’ in Shona (Mosi-oa-Tunya). At 1,708m wide and 108m high -more than twice the height of Niagara falls- it is considered the largest falls in the world (by width and height) as it creates the biggest curtain of falling water and one of the 7 natural wonders of the world. The first European to have discovered the falls was believed to be David Livingstone (in the 1850s) who named the falls in honour of Queen Victoria I. This magnificent geological structure consists of 5 main falls and plunges into two consecutive gorges; the First Gorge (which is up to 108m deep) and the Victoria Falls gorge. Elaborate features including rivers and islands give way to 23km² of riverine jungles and patches of rainforest all of which house an incredible array of flora and fauna. Here you will find mahogany trees, ferns, figs, ilala palms and vines, offering great scenery with one or more of the cascading water blankets. There are also plenty of baboon activity and antelopes drinking, feeding or gallivanting about at ease and sightings of African paradise flycatcher, trumpeter hornbill and other rainforest birds are amongst things you can anticipate. Within the Victoria National Park you can experience sightings of elephants, hippos, crocodile, lions and buffalo along with other bird species like herons, fish eagles and kingfishers, amongst many others. The falls form a massive cloud of droplets –hence the name, the Cloud that thunders- forming a rainbow almost constantly and has a similar visual effect when seen under the moon light. During the flood season (February – May), this cloud of mist can be seen from more than 45km away as it towers to heights of more than 400m. 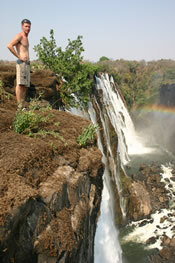 Victoria Falls can be seen from either one of the many viewing points. Apart from enjoying the tranquil setting the falls and its habitat are famous for, you can take up numerous activities like bungee jumping or birding, white water rafting, river cruises, elephant rides, fishing, game drives and viewings and even cultural excursions are available to all travellers. Anything from extreme sports to calm activities unravelling this magnificent world wonder you will be able to take up. Millennia have come, gone and left the Zambezi River intact with tales of kingdoms past. The lower Zambezi offers excellent game viewing and one of the best in the country, whether it is manoeuvring hippos and the abundant wildlife this part of the country has to offer. Lake Kariba is the world’s largest man-made dam in volume and home to a few islands, two of which are inhabited; Chete (the larger one) and Chikanka. Both islands offer breath-taking views and are ideal for a relaxing trip of sand and sun. The lake is known for its impressive hydroelectric power production which supplies both Zambia and is exported to mainly Zimbabwe. The colossal size of the dam may seem like an ocean particularly due to the fact that there is a large and thriving fishing industry. Lake Kariba is also known for its spectacular climate where winters are warm and balmy but humid and hot in the summers. In this area you can visit a site with trees over 150 million years old at Chirundu Fossil Forest, some of which are elevated at 3m high and believed to represent a site of wood and stone implement industries from the middle and late stone age. When in Kariba, enjoy the great expanses of this dam either on your own houseboat; take up sport fishing, any other water sports or just lie down on the sand and soak up the sun. around further away from Kariba and around the Zambezi you can take up a another range of activities which also include birding, walking safaris, intriguing night game drives or daytime game viewing most of which you can do with as a family, honeymoon couple or groups of students almost at any time of the year. Major national parks, rivers, forests and competitive animal life is what the Luangwa Valley is known for. This world renowned wildlife sanctuary is exemplary of all the wild, thrilling and mysterious that Africa has to offer. Luangwa valley lies at the tail of the Great Rift Valley offering magnificent scenery of the escarpments. This valley is comprised of 700km in length and 100km in breadth. The scenery’s glamour is fortified by the Muchinga Mountain range on the west side of the valley and a similar landscape to the east. At the heart of the Luangwa valley is dozens of sand rivers that disappear and reappear due to dry and rainy (flooding) seasons, leaving behind ‘ox bow’ lagoons as a result of a series of formations – features that are crucial to the survival of the ecosystem of the valley. 2 national parks are situated on either end of the valley, North and South Luangwa National Parks, surrounded by thick vegetation and a riverine forest that is green all year round. The overabundance of the hippos along the Luangwa River thanks to the British South Africa Company’s ban on hunting in the 19th Century which later established the first game reserve in the country in 1904. The Luangwa River is one of the main tributaries of the Zambezi River and amongst the 4 biggest rivers of Zambia mostly famous for being a wildlife haven. This valley and its national parks, rivers and other features offer an exciting variety of wildlife. Many animals will be found either taking up refuge from the sun or feeding under or from vegetation that is scattered in the area including the indigenous Thornicroft’s giraffes and Crawshay’s zebra, but you will also find buffalo, plenty of elephants and lions amongst other predators. The Luangwa valley with its national parks and rivers boast an endless list of exciting activities for all its visitors that encompass viewing its magnificent wildlife, culture or simply just taking in all the beauty and serenity from the views that surround. Go on a day or night game drive, walking safaris or visit local villages and learn about medicinal uses of local plants and participate in local traditional ceremonies and dances. If you would like to pair any of those activities with something more humanitarian, then get involved with any of the conservation or charity projects and help promote responsible tourism. Right in the heart of Zambia lays Kafue National Park, the oldest and largest national park in Zambia and the second largest national park in the whole continent. Despite the size of the park and its accessibility and short distance from major towns, Kafue national park remains unexplored and unspoilt, making it all the more an idyllic place to visit. The fact that the park is largely unexplored with a very limited number of lodges or camps, allows the ecology to flourish and for different species to grown in numbers and co-exist. Kafue is contested to hold the greatest diversity of wildlife of any national park on the continent and is vastly protected and monitored by the Zambian Wildlife Auhority. Covered in mostly semi-deciduous vegetation, teak forests and Mopane woodlands, Kafue is divided into north and south by Zambia’s most central river, the Kafue River. This water body runs for more than 950km and acts as the main tributary for the Zambezi, further reinforcing the significance of the river and the national park. The river banks are a great attraction for crocodiles who can stay close to waters yet bask in the sun, some elephant and a great site for animal activity. In the north west of the park is where the famous Busanga floodplain lies. This site boasts massive grazing land and lush water meadows allowing for impressive animal activities and in extremely large numbers, herds and flocks. Thanks to the floodplains, you will be able to experience sightings of pelicans, geese, open-billed and saddle-billed storks, cranes and many more species for the bird enthusiast. Other animals that are frequently spotted in Busanga are Cape buffalo, a large number of antelope species including several duiker species and predators such as wild dogs, lions, leopard and cheetah. Kafue National Park provides a range of activities guaranteeing a memorable experience; these include game drives that you can do at night or in the day in open vehicles, sunset boat cruises, walking safaris, bird watching, canoeing, fishing and picnics. You may also combine those activities with other tours that see you experiencing traditional ceremonies, participating in community projects, learning tricks of traditional fishing or just visiting heritage sites and local surrounding villages. A magnificent southern African state, Zimbabwe is a landlocked country bordering South Africa, Zambia, Botswana and Mozambique, and nestled between the Zambezi and Limpopo rivers. The capital city is Harare and holds the country’s biggest and busiest airport with Bulawayo being the second largest and busiest city in the country. In Zimbabwe, there are 6 main ethnic groups with Shona representing more than 80% of the population. The name of the country, derived from the Shona language (Dzimba dza Mabwe) to mean “Great Houses of Stone” is home to the discovery of human remains that are believed to be more than 500,000 years old. With immense warranted enthusiasm over the magical Victoria Falls, Lake Kariba which lies on the Zambia-Zimbabwe border is the world’s largest reservoir in terms of volume, all of which stand in parity with Zimbabwe’s nature, history and culture. The climate in Zimbabwe is tropical but the altitude plays a great role in moderating temperatures and influencing rainfall. Maximum and minimum temperatures and between seasons are generally not extreme with summer temperatures averaging 21-30°C and in winter 7-16°C. Rainy seasons are usually between November and March with an average rainfall or 100-213mm while dry seasons are between June and September. Zimbabwe is a land endowed with exciting flora and fauna. With more than 8 national parks, mountains, plateaus, kopjes, rivers and falls, you are guaranteed exquisite experiences with the wild. Most of Zimbabwe is comprised of a central plateau extending from the northwest to the southwest of the country with a mountainous terrain on the eastern parts, where you will find the country’s highest point –Mount Nyangani- standing at 2,592m above sea level near the border with Mozambique. Despite the elevation which allows thick evergreen forests, Zimbabwe is mostly a savannah forming an ecosystem for 350 species (including the ‘Big 5’), more than 500 bird species and over 130 fish species. The vegetation offers an abundance of hibiscus, spider lilies, teak, thorn trees, mahogany, Australasian eucalyptus and many other indigenous trees growing up to 90ft high. National and official languages of Zimbabwe are Shona, Sindebele and English. Other languages include Venda, Shangaan and Sotho. Zimbabwe is not a yellow fever zone but we highly recommended you acquire your yellow fever vaccination card before you plan your trip. Further recommendations on vaccines include mumps, hepatitis A and B, typhoid, meningitis and measles amongst others. Precautionary means from disease and infection are not limited to vaccinations, measures can be taken against malaria by taking prophylactic drugs that are prescribed by your doctor and remember to wear long-sleeved shirts/ t-shirts and long trousers/ skirts particularly around sunrise and in the evenings. Apply an ample amount of mosquito repellent to prevent any mosquito bites and make use of the mosquito netting that is provided in hotels and resorts. Travel with some over-the-counter medication as a quick-fix from heartburn, headaches and diarrhoea. Also pack anti-histamines, bandages, hand sanitizers and your prescribed anti-malaria drugs. Visa fees for all passport holders are USD$30 for a 30-day single entry visa. US, Australian, New Zealand and most EU citizens are not required to acquire visa clearance before they arrive into Zimbabwe, but we strongly suggest you arrange your visa prior to your departure to Zimbabwe. Remember to contact your travel agent or a Zimbabwean diplomatic representative in your country when planning your trip and note that the above information is only a guideline and is subject to change. Also, ensure that your passport has at least 2 pages (if your only destination is Zimbabwe) or 6 pages with multiple stops and a minimum of 6 months before expiration after you have returned from your trip(s). Chameleon will NOT be responsible for any discrepancies with your passport or visa. Make sure that you have a photocopy of your passport in the event your original gets lost. The US Dollar, South African Rand, Sterling Pound and the Botswana Pula have officially replaced Zimbabwean Dollar (since 2009) with the US Dollar being the most widely used currency. Credit cards (mostly Visa and Mastercard) and debit cards are accepted by most of the larger operators, hotels and restaurants and smaller operators, restaurants, hotels and bars will only accept cash. There are Barclay’s ATM machines found in all major cities and towns and even in some hotels and malls – all of which will only accept a Visa card. Kindly confirm with your bank about any additional charges you may incur when drawing money from ATM machines. Traveller’s cheques are not accepted. Any currency exchange should be done in official currency exchange points only as any illegitimate currency exchange is considered a criminal act. Carry small denominations of money as otherwise it may prove difficult to get the right amount of change particularly when making purchases from small shops, vendors or restaurants. Please note that the above information is subject to change at any time and should be used as a guideline only. Chameleon Holidays cannot be held responsible for any changes or misinterpretation of information provided. Zimbabwe’s economy relies largely on farming, which is the country’s biggest economic sector and traditionally a net exporter of food products accounting for more than 20% of the economy and employing more than 65% of the labour force. Agricultural products include cotton tobacco, wheat, coffee, goats and pigs. Mining is a competitive sector of the Zimbabwean economy in terms of GDP and rate of population the industry employs with major products including cement, chemical and fertilizers, but the country is mostly known for producing and exporting large amounts of platinum, gold, cotton (textiles) and diamonds amongst many others. Power outlets used in Zimbabwe are UK 3-pin plugs. At the Zambia-Zimbabwe border and on the Zambezi river you will find Victoria Falls, which is also known as ‘the Smoke that Thunders’ in Shona (Mosi-oa-Tunya). At 1,708m wide and 108m high -more than twice the height of Niagara falls- it is considered the largest falls in the world (by width and height) as it creates the biggest curtain of falling water and one of the 7 natural wonders of the world. The first European to have discovered the falls was believed to be David Livingstone (in the 1850s) who named the falls in honour of Queen Victoria I.
Victoria falls can be seen from either Zambia or Zimbabwe from either one of the many viewing points. Apart from enjoying the tranquil setting the falls and its habitat are famous for, you can take up numerous activities like bungee jumping or birding. This is the cosmopolitan capital city of Zimbabwe that offers great journeys through arts, culture, history and nature. Harare offers its visitor a great climate all year round with streets easy to navigate, an array of shops, services, restaurants and sights to explore. The city was initially called Salisbury when it was established by the British in 1890 and after independence in the early 1980s Harare became its name. Amongst the many attractions to see are Harare Gardens and Mukuvisi Woodlands. Harare Gardens is beautiful park in the city with depictions of the rainforest and miniature Victoria Falls and Zambezi Gorge. The park is peaceful but caution to all visitors to avoid walking through the park alone at night and leaving belongings unattended. Mukuvisi Woodlands is 26.5km² reserve that serves as an environmental centre that is less than 10km to the east of the city centre. Most of Mukuvisi is a natural parkland offering a tranquil and ideal atmosphere for picnics, walking and birding while the rest of the park is a wildlife park where you can watch several animals going about their routines, including zebra, warthog, giraffe and different antelope. With Zimbabwe’s capital being a trade centre for tobacco (and other agricultural products), a fascinating tour to go on would be to witness the tobacco auctions. Located in the northwest corner of Zimbabwe and stretching up to 14,650km², Hwange National Park is the country’s largest national park. The park’s source of water is scarce with scant vegetation due to its very close proximity to the Kalahari Desert. Nevertheless, the park holds woodlands, seasonal wetlands which allow for much grass and mopane woodland in the north and south of the park. More the national park is the Kalahari sands, granites, gneisses and basalt rocks. Animal life in Hwange is impressive with all of Zimbabwe’s protected animals, 400 bird species, over 100 types of mammals and one of world’s largest concentrations of elephants reaching up to 30,000. The population of African wild dogs is equally impressive as it is thought to be the largest surviving group. You are likely to see other animals including leopards, cheetah, lions and spotted hyena. The best time to view the wildlife is between July and October as they gather around the large number of water holes and pans to drink. You can see the animals on a game drive from Nyamandhlovu platform which is the best game viewing area in the park or visit the Dom waterhole for incredible views of the sunset. More than 2,200km ² of land reserved as a national park and a wildlife estate that makes way to intertwine rivers, sandbanks, pools, islands and forests. Designated a UNESCO World Heritage Site, Mana pools (meaning 4 in Shona and indicating to the 4 permanent pools in the park) is situated in the northern most parts of Zimbabwe and is remote and distant from any town. A place worth your visit when in Zimbabwe as it hosts forests of Mahogany, ebony wild figs and baobab and is where you will find the largest concentrations of hippo and crocodiles and is home to elephants and buffalos particularly in the dry season. Other animals include plenty of zebra and antelopes. The Best time to visit is September and October as the weather is warm and animal activities and particularly their congregation around water holes and lakes to drink are heightened then. However, you can still visit the pools between March and August for a more comfort oriented trip. Although game viewing would be amongst activities you can take up that would keep you occupied for the entire day, you can also go on photographic safaris, go canoeing in one of the lakes, pools or along the river or even embark on a walking safari. Also known as Great Zimbabwe (Zimbabwe, meaning ‘house of stone’ in Shona), and the region’s most important and biggest stone ruins is a magnificent site every visitor to Zimbabwe must treat themselves to. Divided into 3 clusters; the Hill Ruins, the Great Enclosure and the Valley Ruins, all of which are a testament to the Bantu civilisation of the Shona and formerly a massive gold and ivory trading hub, the ruins are a UNESCO World Heritage Site spreading to 8km² and forming part of a kingdom that has been renowned since the Middle Ages. The Hills Ruins hosts strata of an ancient human settlement of the Kingdom of Zimbabwe, passageways that are partially covered and granite posts with stone-carved birds mounted all of which are considered to be part of a royal city and indicative of a locale of ritual significance. The Valley Ruins and the Great Enclosure enfold living settlements that date back to the 19th and 14th century, respectively. Huts made of granite sand and clay, great stone walls and enclosures, and a structured architectural construction reveal great craftsmanship in the carvings. Excavations and ruins at the site revealed glass beads, Chinese and Persian pottery and porcelain, Arab coins and much more. Apart from serving as a world renowned archaeological site, modern communities take sanctuary in Great Zimbabwe for ritual purposes. Embark on a historical and archaeological journey of a site that is truly telling of itself, one that serves a great significance to contemporary Zimbabwe and Africa by visiting these ruins which are only hours away from Bulawayo (one of Zimbabwe’s larger cities). This magical place in Zimbabwe is part of a 3,000km² geological phenomena that was named by the founder of the Ndebele nation as Matobo Hills to mean ‘bald head’. The tale to the name began more than 2 billion years ago when tectonic and plate movements forced granite to the surface and intense exposure to different elements in the atmosphere carved the granite into smooth large surfaces and boulders with clusters of vegetation sprouting harmoniously amongst these magnificent structures. These hills are part of the 420km² of national park (a composition of the 3,000km² expanse) and a UNESCO World Heritage Site. Cecil Rhodes was buried here at a site known as World’s View (a site very popular for tourists and believed to have a view of the world) but had also left his mark historically when he boldly and successfully persuaded the Ndebele leaders to disarm during their conflict with white settlers in the surrounding hills. A place fit for a world heritage site and national park, Matobo Hills showcase immense botanical diversity, numerous granite kopjes and wooded valleys, a home to more than 200 different species of trees, 100 grass species, different species of wild herb and aloe plants and exotic vegetation including the mountain acacia, wild pear and paperbark tree. The animal life at Matobo is equally impressive having the world’s largest concentration of black eagles in the wild. This site boasts almost 90 mammal species, about 170 bird species, more than 35 snake species and over a dozen fish species. When visiting Matobo Hills you are likely to see sable antelope, impala, and the world’s largest population of leopard which feeds on the abundant numbers of hyrax. An added bonus to the wildlife in this park is the recently reintroduced white and black rhino, giraffe, wildebeest, ostrich and zebra, all found in the western parts of the park, which is currently an intensive protection zone. If flora and fauna are not enough to drive flocks of holiday makers to Matobo Hills, then the rock painting is a surety of excitement to visitors. Here is a place where the San lived on these hills more than 2,000 years ago and as a result have left an archaeological treasure with more than 3,000 rock art sites which are believed to be more than 1,500 years old. Explore the whaleback mountains and hills, their valleys and everything in between that Matobo Hills can offer through an array of excursions where your experience is sure to be unforgettable.